Continuing my argument from my last post that I am a peasant at heart, I'll always prefer homemade foods over restaurant foods. And what better opportunity of having homemade foods would there be than a potluck of food bloggers. A few weeks back, us food bloggers based in the United Arab Emirates were invited to a potluck at the lovely Devina's house ("Since I can't cook for all of ya, the least I can do is offer my house up. "). To make sure we all bring something, she added the Wikipedia definition of what a potluck is about. Homemade foods radiate comfort. It's foods that can be shared with families and friends. Foods that are eaten when you enjoy the company of the people around you. Foods that are packed with flavors. Foods that mirror the culture of the cook. Recipes that possibly have been passed on from generation to generation. The potluck then adds a random note to it. A wild collection of different foods. I think I ate myself through every single bowl on the long table. Afterwards I packed a huge doggie bag. In that bag was the last piece of the most delicious Pumpkin Frittata, made by Sidiqa of Spontaneous Euphoria. Since I have been going on a mostly grain-free diet, I am very open to egg dishes. Flavorful egg dishes that is. 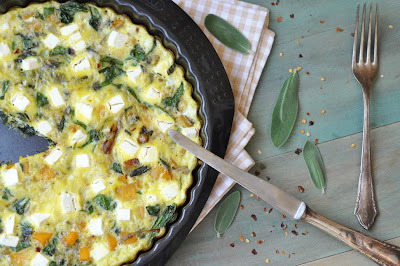 This frittata has the most amazing flavor profile, combining sweet butternut, fresh sage, salty feta and some chili flakes. I added spinach to my version. I have to stop myself not to eat the whole thing (with 6 eggs in it). That's how good it is. It's good to have for breakfast, lunch and/or dinner. Preheat oven to 180C/375F. Lightly grease oven-proof pan or cake tin (no bigger than 8 inches/20cm). Set aside. In a another pan, heat the olive oil over medium heat. Add onions and season with a pinch of salt. Cook onions until softened. Add garlic halves, sage and chili flakes and cook until fragrant, another minute or so. Now add the pumpkin and cook until soft and slightly caramelized. Add the spinach and cook until just wilted. Take off the heat. Take out the garlic. Whisk the eggs and pour them into the prepared pan or cake tin. Season with salt and pepper. Add the pumpkin and spinach mixture and spread evenly. Sprinkle the feta on top. Bake for 15-20 minutes or until set. The cooking time depends on how thick your frittata is. Thicker ones will take longer than flat ones.